I had rather mixed feelings about picking this book up. Stieg Larsson’s novels had been intense, impossible to put down, simply fascinating thrillers. Would The Girl in the Spider’s Web live up to this legacy? First of all, the writing style actually tied in very well with the other books. I read all the novels in German, so I’m sure whoever did the translation did a great job with it as well. To be honest, I hadn’t expected it o fit this well. There are only minor differences in David Lagercrantz’s way of telling the story compared to Stieg Larsson’s work. It’s not as brilliant as Larsson’s but still extremely well written and thrilling. The plot is also interesting as this time, it’s not as personal for Lisbeth or Mikael. Still, Lagercrantz managed to make it sound reasonable that they both play vital roles. I had heard some rather negative thoughts on his way of writing Lisbeth but I think he did a splendid job. Of course, the characters will seem different as they are not the main focus in this story, Lisbeth isn’t as intense as we know her. Nevertheless, I am surprised how good the novel is. 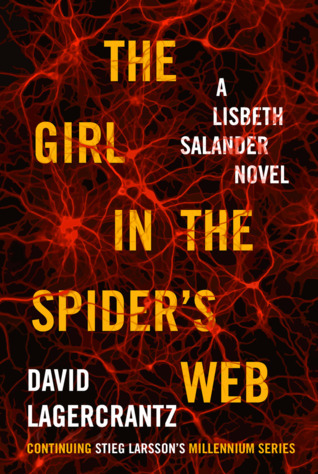 If you allow yourself to forget that The Girl in the Spider’s Web was written by someone other than Stieg Larsson, you will see how well it fits into the Millenium series. A gripping novel you won’t be able to put down! Follow me on Facebook, Twitter, Bloglovin‘, Tumblr, Goodreads or Instagram! Sounds like a great book. I only watched the Swedish movies, never actually read the books. I wonder if I ruined the fun in reading them.. I watched the Swedish movies some time ago – really good!